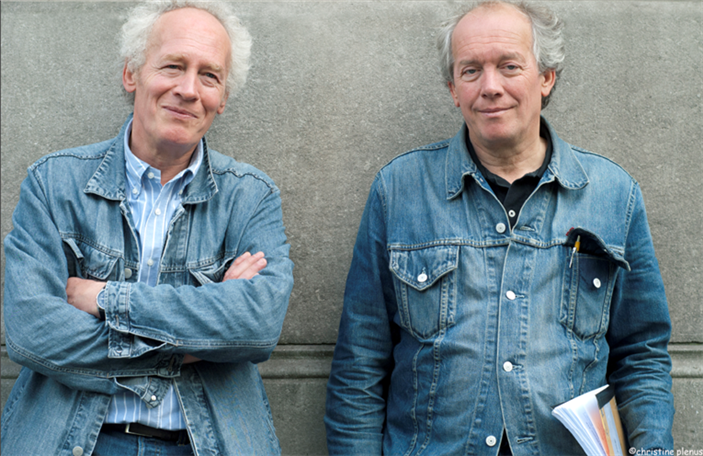 Belgian brothers Jean Pierre (above left) and Luc (above right) Dardenne have been lauded worldwide as auteurs for their realistic dramas of everyday, contemporary life since the mid-90s when they launched their production company, Les Films du Fleuve (having already produced some sixty documentaries with their earlier company, Dérives). In 1996 The Promise brought them high esteem, which has only grown with award-winning, heart-wrenching films ever since: Rosetta, 1999; The Son, 2002; The Child, 2005; and Lorna’s Silence, 2008. In The Kid with a Bike, eleven-year-old Cyril (Thomas Doret) cannot let go when his father (Jérémie Renier), abandons him. Through circumstances we come to feel more than to know, he becomes the ward of a hairdresser, Samantha (Cécile de France, who is actually Belgian), who struggles with his erratic behavior much as they both prefer life together, difficult as it is. There is a bumper car scene at an amusement park that recalls the riveting devastation of Mouchette in Robert Bresson’s 1967 classic. Yet the film is a departure for the Dardennes in several ways — casting, music, an often moving camera tracking very physical action, and a peaceful ending. In the following interview in Beverly Hills prior to their screenings at the 2011 AFI FEST, they discuss some of these aspects of their latest film. Diane Sippl My first question is about viewing your films. Some people say that your films are getting more and more accessible to watch, so are you making them that way, or are we just getting used to seeing them — to your film language? Luc Dardenne I do think that this movie is perhaps easier for a large public. This story is simple; it’s a little bit like a fairy tale. So that creates something that is more accessible. You have this child placed in front of Samantha, who has a desire for adopting at some point. There’s something a little more obvious about this film. DS I could be wrong, but maybe there are some specifics that make it easier to watch. I noticed music in this film, and I don’t remember music before this — am I correct? I mean off-screen music — maybe before you had on-screen music. JPD That’s right — okay. DS So why use the off-screen music — any music off-screen? JPD It was already in the screenplay. And then once we really started to try, when the editing was almost complete, it was a little difficult to implement it. It was mostly a question of finding the right length. But from the beginning this music was almost like a caress that was coming toward Cyril. That’s what Cyril is missing, softness and caressing. And the music brings that to him. DS So does that explain why this particular piece, because you use only the phrase — not the passage. Does that explain the choice of the phrase (from Beethoven’s 5th Piano Concerto)? JPD Yes, because this music does not come from the movie, it’s not underscoring something in the movie; it’s above the movie. DS Yes, I felt this, but I also wondered why you cut it short — to keep it above? JPD Well, it just seemed enough for us. In the beginning it was longer, and the fact that it was above meant that it kind of drowned the theme if it was too long. So we didn’t feel for this caress that it was covering a little bit; it just felt like it was drowning it, and the energy of the scene was lost. You know, it’s something brief, and it’s also something that’s missing for us as viewers: we want it to continue, but no. It leaves the spectator waiting for something, wanting something to continue, and it will come — at the end. DS Yes, I agree, but there’s another side of it, because we know this phrase. We all know this music, so we can continue it in our minds, so I wondered why you chose a phrase we all know, and not an original composition. So that we can complete it? DS Well I personally love that phrase of that music, so you chose well — I love it for the reasons that you say: It’s “above”; I love it for that. And I felt gratified in the credits when you let it continue, at the end. JPD I also think that the music kind of divides the movie. It divides it into three sections. We use it three times, and at the end. DS It makes a musical language for the film. Visually, I noticed in your last film, Lorna’s Silence, primary colors. I saw them again in this film. Is it something you find you always use? Is there a reason? Was it planned at all? LD When we’re looking for costumes for the actors, we often just find that it helps. Red looked good on The Kid — something about that color lit up his face and underscored his intensity. And we also saw the red in relation to the green of the forest, the trees, and it always made him more like a fairy tale character who’s in the forest — when he’s in the woods, an evil force comes in. DS What makes it a fairy tale for you? JPD There are several things involved. I think there’s the simplicity of the character. Samantha appears as the Good Witch very quickly. Wes, who’s in the woods, is the bad guy. And the principle player, who is a small child, as in all fairy tales, has to lose his illusions in order to grow up. And here, he has to lose a terrible illusion, which is the one that his father loves him. DS Do you think so? Do we need some moral fables, in a way, with good and evil clear for us to think about? LD I saw neither of these films. I don’t know — I don’t know how to answer this question. The simplicity of the story came from the space in which we shot the film. There’s the city, where Samantha lives; there’s the woods, where the bad guys are; and then there’s the gas station. So we put the father outside of the city, somewhere else. And each time we were creating a new scene for the film we realized that we were coming back to the same places. And I think the simplicity comes from there. And when we imagined this story, we hadn’t shot Lorna yet, but we were thinking to ourselves, it would be good if we created this triangle. And I think that’s what gave the simplicity to the story. But maybe today, with the brutal and savage world that we live in, we need to tell each other fairy tales. DS Well, it gives me another question, which is about your tendency to use youths. You always have a young person — a teenager, or a preteen — in your films, and of course once you have this young person, you can have such a simple story, or a fairy tale, or a moral fable. So why do you like to go that direction, of writing and casting a young person each time? JPD Well, this could be just an after-the-fact kind of thought that comes to me, but I’m going to tell you a simple reason. It’s their story we want to tell, and that’s the story we want to tell. Intergenerational stories are always relationships between children or adolescents and adults. These children are living in situations in which children should not be forced to live, and each film is, in a sense, a way to save each one of them. DS So you have a kind of moral mission. DS But I feel that we all do, with every film you make, and not in a bad way — we look for you — for your films — to have some moral stance in the world. JPD Yes, I agree, there is that, but the word “mission” kind of throws it off… Our mission is only to save the young people in the film. DS You say it’s “only” to save them — but you do. JPD In the film. When you show a film about a child who needs to be or is saved, it does bring you to think about reality and the need for softness and caressing of a child in real life. DS Your characters often seem to have some compulsive, nervous behaviors — for example, Olivier Gourmet is always “working out” in The Son, and here Cyril is extremely wound-up and aggressive, at the very least, obsessively playing with the water tap in Samantha’s hair salon. Do you choose them for this? Is this hyper-activity something you see in our world, or is it a matter of it being good for your filmmaking? JPD Olivier Gourmet’s reasons for it in The Son are not the same as the child’s reasons here. Gourmet’s back is bad in that film, so he has to exercise it. In The Kid with a Bike, the obsessing over the water tap is first a ploy to get Samantha’s attention, and then it also comes out of the scene before it, the experience Cyril had with his dad. DS There seems to be more open, overt action in this film than in your previous works. The “action” is less covert and bottled up than in, for example, The Son (though there is that wonderful “chase” scene in the lumber yard in The Son). Why so many physical fights — not just between the boys but even with Samantha? LD It came with the choice of the bike. The bike is a main character in this film. Cyril uses his bike as a way to seduce Samantha, as a link to his dad, and as his best friend. It becomes his own once he leaves his dad for Samantha. You know, when you ride a bike, you’re alone with your bike on the road — it’s you and your bike. DS You have featured Jérémie Renier in your films since his youth. What about him continues to catch you after four films now? DS Lately you keep having him play the bad guy. LD He plays the good guy everywhere else. We try to give him more possibilities, to expand his roles, to show his diverse gifts. DS What does Cécile de France mean for you in this film? Isn’t she a “star”? JPD It was a challenge for us to cast her, to see if we could work with a star. Having done it, we think it went well, and we’d like to see if we can make her part of our team. DS How much do you think role modeling becomes a central theme in your films? LD Regarding apprenticeship and work, we want to show how a young person learns responsibility to the society, respect for it, and how to make a contribution to it. When you have a child in your film, you have a responsibility to show a relation with adults. For example, when is it parenting? When you lecture the child? When you talk to the child? Or when you show something — an adult who teaches a child how to do something? DS Why did you have Samantha and Cyril switch bikes at the end of the film? For symbolic value? LD That was strictly for comic relief, because her bike is too big for him, as his is too small for her. DS Who is your favorite audience? LD I don’t have one. JPD The public today is so divided up with “target audiences” and we would like to keep it open, to open it up to all — young people, old ones, men, women, everyone…. Director: Jean-Pierre and Luc Dardenne; Producers: Jean-Pierre and Luc Dardenne, Denis Freyd; Screenplay: Jean-Pierre and Luc Dardenne; Cinematographer: Alain Marcoen (s.b.c. ); Editor: Marie-Hélène Dozo; Sound: Jean-Pierre Duret, Benoit De Clerck, Thomas Gauder; Set Designer: Igor Gabriel; Costume Designer: Maïra Ramedhan-Levi. Cast: Cécile de France, Thomas Doret, Jérémie Renier, Fabrizio Rongione, Egon Di Mateo, Olivier Gourmet. Color, 35mm Scope, 87 min. In French with English subtitles.